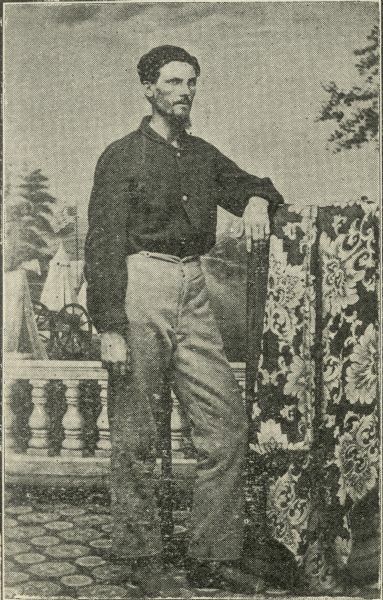 Robert K. Beecham studio portrait in front of a painted background, at age 26. In the book "As If It Were Glory", Robert Beecham recounts his Civil War experiences, both as an enlisted man in the fabled Iron Brigade and as an officer commanding a newly raised African American unit. Serving from May 1861 through the end of the war, Beecham saw action with the 2nd Wisconsin at Chancellorsville and at Gettysburg, where he was taken prisoner by the Confederates. After being exchanged, he was promoted to First Lieutenant in a black regiment. Leading the men of the 23rd USCT in fierce fighting at the Battle of the Crater, Beecham was wounded, again captured, and after eight months in a Confederate prison, escaped.